The one of a kind snifter given to us at the dinner. Filled with Farmhouse Black Metal Stout. Javi here. I know this is not at all a beer blog of any sorts, but this was such a cool event that I wanted to write up about it. Here's just a bit of background, 11/12/11-11/19/11 was the first inaugural Dallas Beer Week. 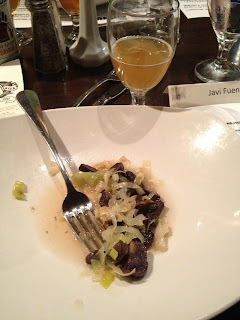 There was a great variety of events including the first public showcasing of the Deep Ellum Brewery at The Common Table, a blind beer challenge over at The Holy Grail, and the event I'm talking about today, the Mikkeller/Jester King Beer Dinner with special guest Mikkel Borg Bjergsø, Thomas Schon and various Jester King employees. They were on hand to talk a little about their beers, their collaborations, and some of the history about their process of making some of their beers. Local bar, the aforementioned Common Table, hosted the event where they closed the restaurant down from 6:15 until about 9:15. Mad props to owner Corey Pond and his chefs for accommodating my request for a vegetarian alternative to the menu so I could also partake on fun. They went above and beyond and made everything vegan for me as well. Below is a description and (slightly hazy) thoughts about the pairings broken down by the courses. Please pardon my amateur language as I'm not much of a foodie. Meet and Greet: Artisan Cheeses with Drink' in the Sunbelt (4.5% ABV). This part I honestly participated very little in because as I got to the Common Table later than anticipated and most of the cheeses were already gone. I'll tell you that at the very least the Mikkeller/Jester King collaboration Drink' in the Sunbelt, a play on Mikkeller's Drink' in the Sun, goes well with blackberries and strawberries. 1st course- Vegan grits with cranberry and a Milkkeller Texas Ranger (6.6% ABV). This was an interesting pairing. The Mikkeller Texas Ranger is a chill-porter. For those not familiar with this type of beer, here's a video from the Mikkeller site. But basically, it's a very spicy (and I mean hot sauce spicy, not spice-spicy) and dark that was created as a tribute to Texas culture. The pairing itself was interesting one, where the sweetness of the cranberries and the flavor of the grits contrasted with the hot flavor of the Texas Ranger. 2nd course- A Mesclun salad with toasted seeds, cherry tomatoes, and pomegranate habanera vinaigrette along with a Jester King Farmhouse Wytchmaker Rye IPA(7.3% ABV). Where the first course had a spicy beer and a milder entree, this course had a horribly spicy entree and a slightly milder beer. This was one of my favorite dishes. The texture of the seeds with delicious, and the pomegranate habanera vinaigrette made this dish something that I couldn't stop eating, but that hurt like hell to eat. The beer is was the farmhouse version of the Wytchmaker Rye IPA. It seems that Jester King will be brewing this style exclusively with farmhouse yeast. This will allow the beer all brewed over at Hill Country to have their own distinct flavor. Here's a good post over at the Jester King site about their new process. 3rd course- Purple potatoes and melted leeks with a cilantro champagne lemon grass broth with a Jester King Das Wunderkind (4.2% ABV). This was probably one of the best pairings of the whole dinner. The Das Wunderkind has a low ABV at 4.2% with a very light and refreshing taste that complimented the lemon grass broth perfectly. The purple potatoes and the leeks went well together. This was a very strange experience, since I've never had leeks, let alone melted ones, and the potatoes were so strangely colored, I thought they were either meat or mushrooms. But this was very nice and cooling course after the fiery salad we had earlier. 4th course- Walnut Rissotto finished with cabernet whiskey apple along with a Mikkeller Barrel Aged Black Hole (13%ABV). This was a doozy. The thing that impressed me the most was the Mikkeller Barrel Aged Black Hole. This was the strongest beer in the whole dinner with the aforementioned 13% ABV. The Imperial Stout was served in the snifter you saw in the heading above. It was thick and had sweet chocolatey notes that complemented the strong taste of the mushrooms and the small whiskey flavor of the apple very well. But the rissotto felt like the odd ingredient out in this pairing. Dessert- Triple chocolate brownie and pistachio terrine with cracked black pepper strawberry coulis/mixed berries with a Mikkeller Frelser Triple Bock (11.0 % ABV). I'd been raving about this one since I saw the menu. I have no clue what a coulis is-I'll admit-but the thought of pistachio with a triple chocolate brownie was delicious. Originally, they gave me a fruit bowl of mixed berries which were also amazing, but Jonesy was kind of enough to share some (most) of hers with me. The beer on the left was the Frelser Triple Bock, and maybe I was a little too tipsy at that point, but I liked the Black Hole a lot better than the Triple Bock as a pairing with this desert. The dinner, being the communal thing that it was, gave us a chance to meet some other people that are just as big beer fans from around the area. We had one of the contributors from local veggie food blog Yummy Awesome, who had the coolest cassette iPhone case, and couple with the fact that the blog has a vegetarian edge to it made me pretty happy. Then we had Stephen Walden, local beer enthusiast and manager for local specialty store Kegs and Barrels in Plano. He was an especially awesome dude showing off great passion for the craft of brewing wanting to share that with people through his store. He was kind enough to give me a glass of the Jester King Farmhouse Black Metal Stout. Overall, this was probably the best first beer dinner a guy could have. The atmosphere was amazing, the food and the beer were delicious, and it was really interesting hearing a lot of what the process was behind some of the more interesting beers that have come out in the last few years.